Opened for business in Ballyshannon as of September, 2017, TMC Commercial Garage Ltd. is Ireland’s youngest commercial vehicle test centre. We travelled to the North West to view their stunning state-of-the-art facility and, while we were there, had a chat with Mark McNeely to find out more about this exceptional family-run operation. At TMC, light and heavy commercial vehicles are guaranteed a bit of TLC. Overseen by the McNeely family, who are synonymous with the haulage sector, this exciting new business offers a wide range of services for commercial vehicle owners and operators, including commercial vehicle roadworthiness testing (CVRT) for HGVs and LCVs, pre-tests, test preparation, seatbelt certificates, tachograph calibration and vehicle plating as well as mechanical repairs and servicing. Though TMC Commercial Garage Ltd. has only been in existence for little more than six months, they have hit the ground running and throughout is brisk at their well-appointed, modern vehicle- and customer-friendly Ballyshannon Business Park facility. “It’s going really well so far,” Mark McNeely confirms. 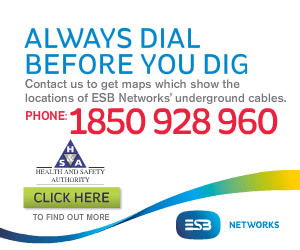 “We knew there was an opening for a test centre here in Ballyshannon as the old one had closed 14 years ago and we believed there’d be strong demand for this service locally. A friendly, professional, affordable, no-nonsense service is provided, promptly and with a minimum of fuss. 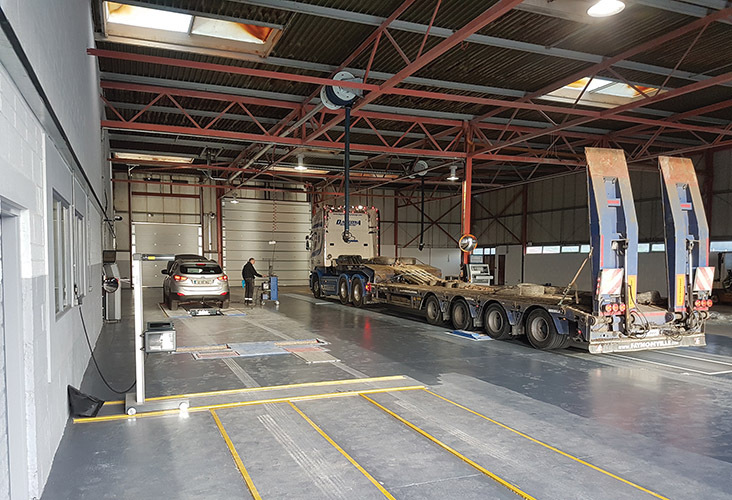 The comfortable, spacious facilities at TMC Commercial Vehicle Test Centre are excellent, with no stone left unturned in ensuring that both vehicles and their owners are looked after during the course of their stay. As for the catchment area covered, most of the trade comes from truck, van and bus operators in Donegal alongside a steady influx of business from neighbouring counties. “It’s mostly Donegal, Sligo and Leitrim, a lot of local business,” says Mark. “There are a good few garages in Ballyshannon and they are all coming here and we’ve had customers from as far away as Gweedore and also Leitrim. Catering for trucks, trailers, vans, jeeps, buses, coaches, ambulances, motorhomes and mixed fleets, TMC Commercial Garage Ltd. has three fully-qualified commercial vehicle testers on hand. The Company is ran and directed by the McNeely family namely Tom McNeely, and his sons Mark and Colin (thus, TMC). Second-worst hit after construction, the haulage sector was decimated by the economic downturn that struck in the late ‘noughties. But there are signs that things are picking up again. “It seems to be busier now but rates for tipper men in particular aren’t good and diesel and insurance have got a hike, so the truckers still have a lot to contend with,” notes Mark. With over 1,500 tests carried out already, TMC Commercial Garage Ltd. is not just Ireland’s newest CVRT test centre but also one of the fastest-growing. Open from 8am until 6pm Monday-Friday and 8am until 1pm Saturday, it has the distinction of being one of only four test centres in Donegal, with only one other outlet (in far-off Letterkenny) handling HGV tests. As well as being a viable commercial entity providing outstanding levels of service and benefiting from a steady flow of repeat business as well as positive referrals through word of mouth, as an added bonus, the new commercial vehicle test centre in Ballyshannon is also contributing in no small way to maximising road safety standards in the north west and beyond by ensuring that vehicles are 100% roadworthy and compliant.